Nadia followed her passion for creativity and design when reading for a degree in Architecture at the University of Malta, during this time she also took an interest in urban regeneration and the way digital technologies are increasingly being incorporated into urban public space. Following her degree Nadia chose to further increase her design skills with a focus on interior design. She adopts an idea driven approach to design and thinking out of the box is an important part of her creative process. Her love of interactive and dynamic environments informs her designs which involve multi-layered interiors with a playful twist. 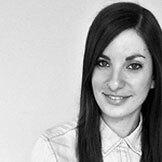 Nadia is now working with Brinkworth designing retail environments.